This Is Your Captain Speaking: MH370 Found? 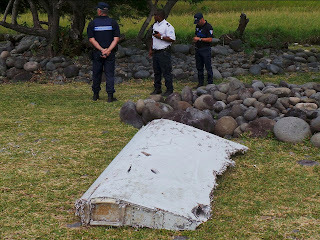 No, but an airplane part and a suitcase have washed up near Madagascar. The part will be tested to determine if it came from the Malaysian jet. If it's determined that the part is from MH370 it won't be of much help finding the rest of the wreckage. Ocean currents are quite random and will provide little help as to where to look other than the places already being searched. The theories that will be put to rest if the part is genuine are the conspiracy theories positing that the aircraft was hijacked and flown to a secret base somewhere. My opinion is that the captain committed murder-suicide with his own airplane for political and other reasons. Not so fast. The barnacles growing on it may provide a clue to the latitude where the aircraft came down. There are both warm water and cold water barnacle species with further differentiation. Barnacles have growth rings in their shells that let you determine their age....so one can go back and determine when they attached. The barnacle species could provide insight into the location of the crash. Note that barnacles are not mollusks but Arthropods. I'll be honest, I never considered barnacles. Perhaps if any are found they can provide insight but will still only reveal the most general of locations. Got to be it. How many 777 parts are in the ocean! Agreed, I believe the probability of this piece being from MH370 is high...if...it is in fact from a 777.